the senior Democrat on the House Education and the Workforce Committee. 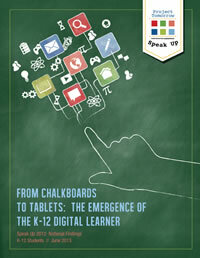 From Chalkboards to Tablets: The Emergence of the K-12 Digital Learner is the second in a two part series to document the key national findings from Speak Up 2012. In 2003, The Speak Up National Research Project was born to give K-12 students a voice in critical conversations, and to hopefully provide their parents, teachers and administrators with new insights about the expectations and aspirations of these newly minted digital learners. Now in its tenth year, the annual Speak Up National Research Project and the resulting trends analysis provides a birds’ eye view of the changing environment for digital learning, both in and out of school. 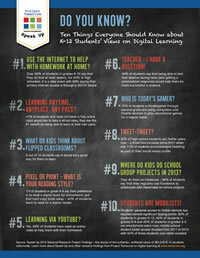 What is the students’ vision for digital learning today and how has that vision evolved over the past ten years? How well are we meeting the current aspirations and expectations of our students, Kindergarten through 12th Grade, for using emerging technologies to personalize their learning process? What can we learn from the emergence of the digital learner that can impact the future of education? With smartphone usage dramatically on the rise — 65 percent of students in grades 6-8 and 80 percent of students in grades 9-12 are smartphone users – a main concern among today’s digital learners is how to leverage the unique features of different devices, from laptops to smartphones to tablets or digital readers, and use them for certain academic tasks. In just one year, the number of middle school students with a personally acquired, digital reader more than doubled from 17 percent in 2011 to 39 percent in 2012. In fall 2011, 26 percent of students in grades 6-8 said that they had a personal tablet computer. In one year’s time, the percentage of middle school students with tablets jumped to 52 percent, a doubling over the 2011 percentage. Despite this increase of mobile devices in the hands of students, schools are still reluctant to allow them. Among high school students with smartphones, only half say they can use their device at school and only nine percent of students say they can use their personal tablets at school. With 73 percentage of high school seniors saying they have a laptop, only 18 percent of the Class of 2013 say they are allowed to use their personal laptop at school. Click here to download the PDF of the report. Click here to view the report in HTML. To download a copy of the first report on Educator and Parent data please click here.